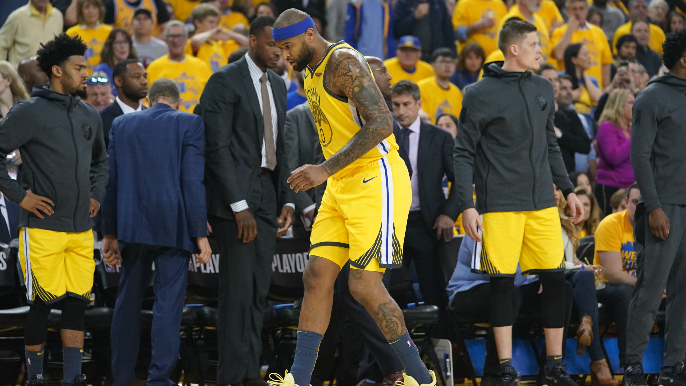 OAKLAND — DeMarcus Cousins left Monday’s Game 2 matchup vs. the Clippers early in the first quarter, with a scary, non-contact injury to what appeared to be his left quad. Cousins is scheduled to have an MRI Tuesday, but there is significant concern that the quad is torn, according to Adrian Wojnarowski of ESPN. A tear would likely keep him out for most, if not all of the postseason. Cousins was attempting to corral a loose ball after forcing a turnover at the other end of the floor. Cousins could not put pressure on the leg after standing up, and limped to the locker room. As has been well documented, Cousins is coming off an Achilles tear, to the same left leg, sustained last season with the New Orleans Pelicans. Cousins was out for nearly a full year with the injury, returning to make his debut with the Warriors on January 18. Since his return, Cousins has averaged 16.3 points and 8.2 rebounds in 25.7 minutes per game.